I am trying to set up a Kalman-Filter to filter position-measurements of a self-driving car. To do so, I consider a state-vector with 5 elements and am now trying to set up the Transition Matrix. As you can see in the following picture, I do not have a clear understanding of the car dynamics. How does my steering for example contribute to my x-position? 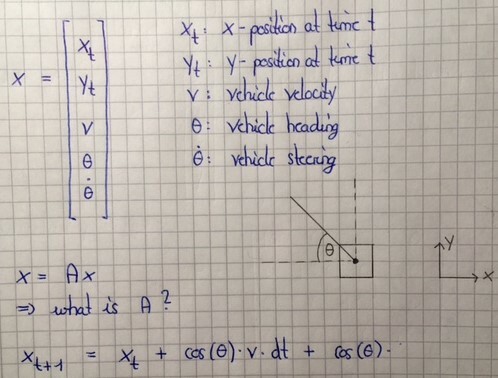 Since steering is the rate of change of the vehicle heading, it must somehow be linked to acceleration. Can anyone help me to figure out A ? When localizing a robot we usually use the world coordinate frame. Since it's static it is easier to represent the position of the robot. As an example you may use the North and East directions as the x and y axis of the world coordinate frame. But if you are travelling on the robot you can notice that the heading direction always changes. Let's take 2 cases to understand this. 1. Robot is travelling to the absolute north with a speed of 1m per second. 2. Robot is travelling to the absolute north-west with a speed of 1m per second. In both cases robot travels towards its' heading direction but in world coordinate frame the heading is different. 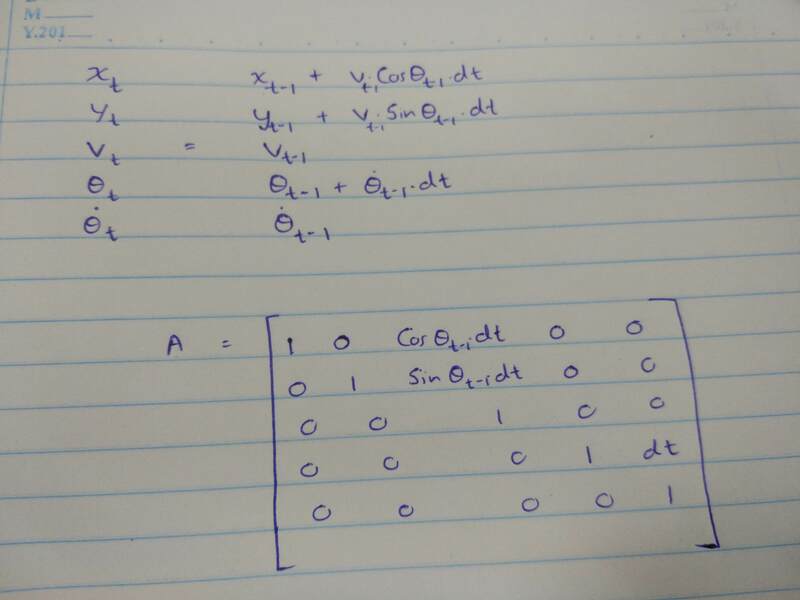 We can calculate the A matrix by assuming that there is no control inputs to the system. Not the answer you're looking for? Browse other questions tagged kalman-filter autonomous-car or ask your own question. How to apply Kalman filter in this case?